I’ve had a hankering for this dish for awhile, dreaming of being in a quaint little Parisian café about to dive into the sweetness of onion, the pungency of nutmeg, and the flakiness of pâte brisée. But how to veganize it without losing all that the French stand for in their cuisine? I can just hear it now, spreading like a whisper across an outraged city of lights, “Mais non! Ce n’est pas possible.” The travesty of it all. Well, now having made this heavenly version, I can say with confidence (and trying my best to put on those French puckered lips) “Mais oui mesdames and messieurs. C’est possible!” Franchement. After the pastry has chilled, line the chilled shell with parchment paper and fill with pie weights. Bake until the pastry is set and pale golden along rim, 15 to 20 minutes. Carefully remove foil and weights and bake the shell until it’s golden all over, 10 to 15 minutes more. Transfer the shell to a rack. While your pasty is cooking, prepare your onions. Heat the olive oil in a heavy bottomed dutch oven. Add onions and stir. Cover to cook over medium-high heat for about 15 minutes or until the onions have started sweating and have become quite soft. Remove the lid and cook for another 15 minutes until onions start to brown a little. Stir often to make sure they don’t burn and you cook them all evenly. Once cooked, add the flour and nutmeg and stir thoroughly so all the onions are coated. Let simmer over medium to low heat for another 3 or 4 minutes. Deglaze the onion mixture with the wine. Let simmer for a minute or two. Add rice or soy cream and stir until the mixture thickens. Add sea salt and pepper to taste and let it bubble away for about 15 minutes more. 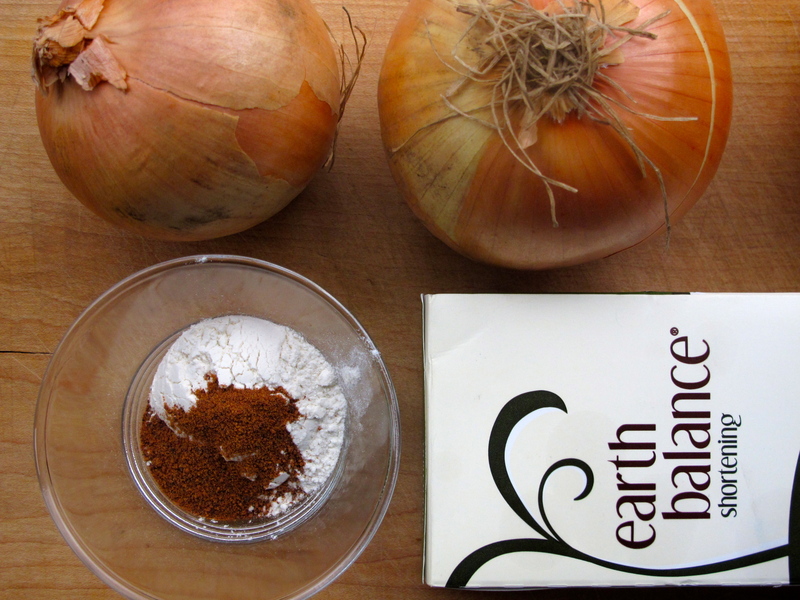 Once the onion filling is cooked through, taste the mixture for seasoning. Adjust if necessary. Place it into the tart shell and spread it out evenly. Bake for approximately 15 minutes, or until the top sets and the filling binds with the sides of the dough. Let cool for a good 15 minutes or so before removing from the pan to let it set up a bit. Slice and serve. 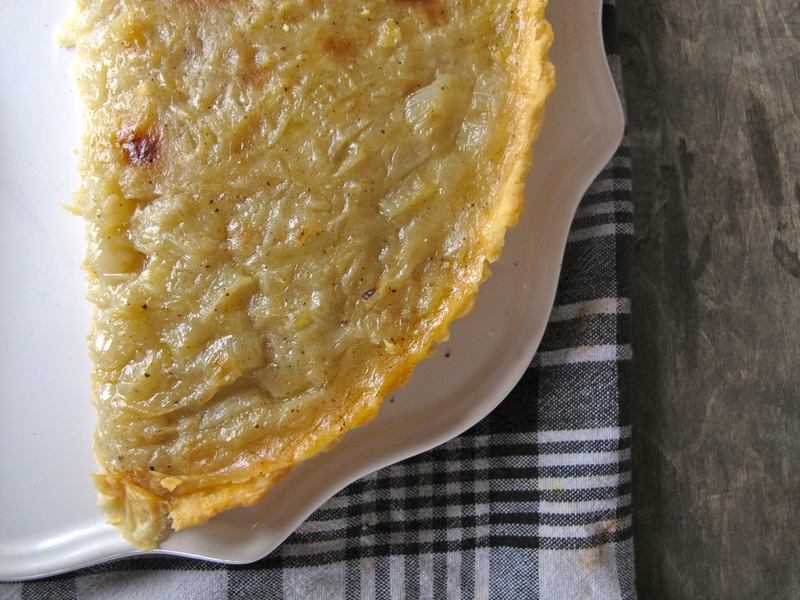 While a nice large tart looks lovely, this recipe also lends itself to small individual tarts. Simply line large muffin tins or ramekins with the pâte brisée, and continue the process. Wine: Pair this baby with a lovely grüner veltliner (a white wine variety grown primarily in Austria with a reputation of being a particularly food-friendly wine) or look to Alsace for a full pinot gris or gewürztraminer. An almost telepathically tardy PS for a V:Pairing… Normally in Alsatian tradition, this dish would be pretty rich (all those eggs and creamy butter) and I would easily look to Alsace — go with the Motherland’s abundant rich pinot gris, a super dry Alsation Riesling or, if the onions are nicely caramelized and the spices are deep, a Gewürztraminer would be lovely. I suspect the veganized spin is a brighter, lighter version, so you could easily go with a wider geographical selection of the wines above. Maybe a pinot grigio that is less full-bodied but still has that lovely pear-honey nose? Or a less-racy riesling? Lots of Ontario selections could fill the bill. Hadn’t considered Grüner Veltliner…it is often very racy (more with creamier dishes?) but could be a winner here. Let’s try! Cheers, and bon apetit!